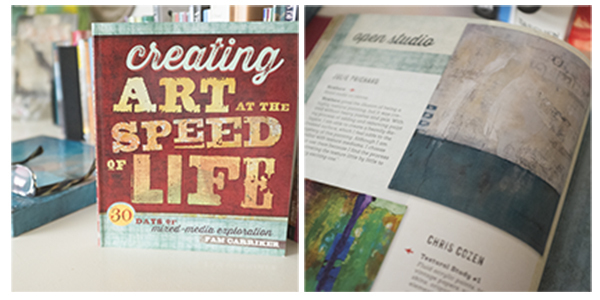 Pam Carriker's new book, "Creating Art At The Speed of Life" has hit the shelves and I am happy to be a contributing artist for the book. Yay! Thanks, Pam! Unlike many of the books out there right now, Pam didn't only fill her pages with articles and art made by mixed-miedia artists that she knows, she filled the pages with knowledge, art, exercises, and motivation to get you going a la Pam Carriker. Pam starts out by showing you how to make a journal that will generously hold all of the exercises she has in the book. Exercises? Right- Pam breaks down art and makes it simple... you'll learn color, texture, shape, line and so much more. "Nowhere"; original mixed media painting created for Pam Carriker. 11x14 on stretched canvas. Texture. Innnn fact...you can find my good friend, Chris Cozen in the same category with me. We're both on page 56. Pam's book is not only nice to look at, it's got a lot of great information in it. You can find the book on Amazon here. But wait.. there's more! Click on THIS LINK to be taken to Pam's facebook page where tomorrow night she will be hosting live Q&A chat with some of the contributors and GIVING AWAY FIVE SIGNED COPIES of the book! Free is fun! Set your alarm clocks and see you there at 7pm CST.